The master’s program is the first of a number of planned initiatives that signal a broader scope for Yeshiva's Sy Syms School of Business. 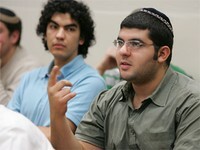 Feb 23, 2009 — This summer, Sy Syms School of Business at Yeshiva University will expand its curriculum to include a master of science in accounting, the first graduate-level program in the school’s 22-year history. Applications are available here. Dr. Joseph Kerstein, on leave from his position as associate professor of accounting at Baruch College, is currently directing the master’s program. Kerstein holds a PhD from Wharton Business School and an MBA from New York University. The program’s faculty—including senior professors at the school and some yet-to-be-announced, new faculty—hold PhDs and conduct and publish research, qualifications required by the NY State Board of Regents. The master’s program begins this summer with co-ed classes on the Beren Campus, conveniently located for those working in accounting firms in midtown. It is the first of a number of planned initiatives that signal a broader scope for the school, including an executive master of business administration degree, joint programs with other Yeshiva University professional schools and a full-fledged honors program for the undergraduate school. Students in the accounting program will have the option to take courses full or part-time but must complete a total of ten courses to earn their degree. In order to accommodate students’ work schedules, two courses will be offered during the summer with four courses offered in each of the fall and spring semesters. For more information, contact Dr. Joseph Kerstein, director of the MS program in accounting, at jkerstei@yu.edu.